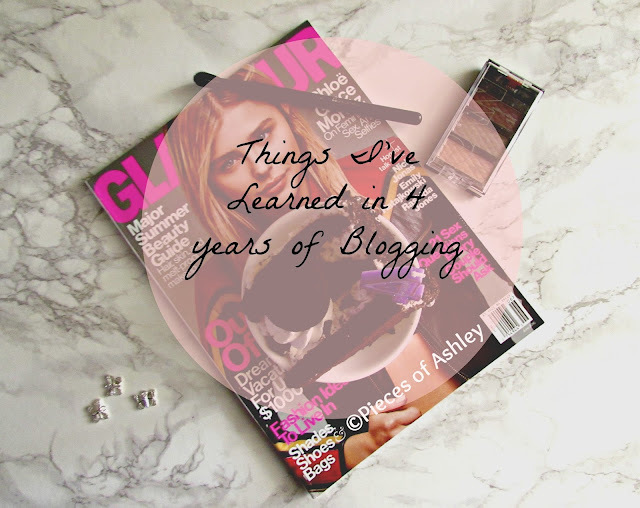 It's crazy and sentimental how on this day 4 years I started blogging. Before than I couldn't have even imagined I would writing let alone on the internet using social media. Except Facebook, I've had that a few years before blogging. I guess I'm reflecting on everything I have experienced and the things I've learned along the way. Whether or not blogging is a job or a hobby for you, both are very hard work. Looking back I have come along way from the girl who didn't know how to take pictures or the girl who didn't think her writing was good enough. I'm not exactly where I want to be, but I have made a lot of big steps. I couldn't imagine not blogging, on twitter I would say this a lot. To be honest it's true, I have came across a lot of people who have inspired me. Not to long ago, I talked about not censoring my blog and expanding the kinds of topics I enjoy. I have so many goals and dreams for my blog. No matter how hard I try I can't seem to stay organized, but I would not be me if I did! While blogging I've learned a few things and I would like to share them with you. It's nothing extreme and if I only knew this when I started I probably wouldn't have went through obstacles and writers block. The one thing I will always be grateful for is the confidence blogging has given me! I'm not 100% confident, but it is more than I have been. I want to start blogging regularly and somewhat consistently. Is there even a such thing as somewhat consistently, am I even making sense? Anyway here are things I've learned from blogging and maybe I can help someone else. Just so you will know, I'm not giving advice. Not because I don't want to, but everyone goes through different experiences and challenges while blogging. Therefore I can't tell you what you should do and not do, quite frankly I don't know myself. But I'm to be the light that goes off, if I gave you an idea for yourself! Patience is very important, if only I knew that in the beginning. I was always easily discouraged and I would fall into a rut. I learned to be patient because things don't happen overnight. Consistency is the truly the key! This has been my biggest down fall over the years. It was hard to stay consistent. I realized it was because I always limited myself and my blog to specific topics. Taking Pictures in bulk, saves a lot of time. I start started taking pictures in bulk a couple of months ago and it really does help. I take pictures during the daytime, because of the sunlight or natural lighting. At night I write, because I am more relaxed. Listening to music helps me too. Getting involved in twitter chats is something I'm grateful for. It build up my confidence, with meeting new people and putting myself out there. This is also a good way to do some self promotion. I'm still getting used to sharing my posts, I don't want to spam everyone's timeline. Being yourself is the number one important thing I've learned. Now this is different because I don't lie about who I am, I just chose what I wanted to share and what I did not. Although some things are off limits right now, I've become more open! I am determined more than ever to become a better blogger for myself! Now although I have not been consistent with blogging I've stuck with it for this long. I haven't gone a year without it. So happy 4th birthday to my blog who I love so much. Even though you're not a person you have helped me so much! I hope you enjoyed reading and feel free to share how long you've been blogging!